Hudson Valley Community College has announced its recipients of the 2018 President's Award for Excellence. 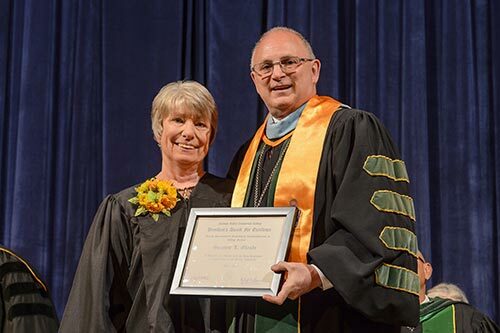 The awards, which have been handed out by Hudson Valley Community College presidents since 1985, were presented at the college's 34th annual Faculty Staff Honors Convocation on May 3. Suzanne L. Glaude, web site specialist in the Information Technology Services department, and Jennifer M. Moss, principal account clerk in the cashier's office, received the President's Award for Excellence in College Service. 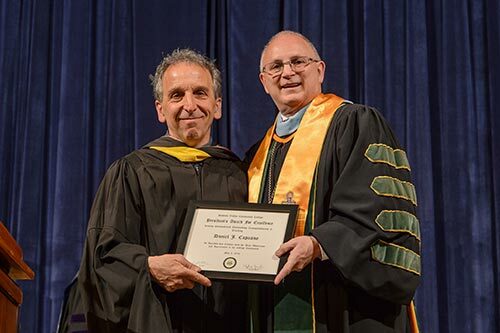 Daniel J. Capuano, an assistant professor in the Biology, Chemistry and Physics Department received the President's Award for Excellence in Teaching. Suzanne L. Glaude, of Averill Park, has been with the college since 1994. She was instrumental in the launch of the college's first online learning platform, Topclass, in 1997. She became the primary system administrator for Blackboard upon its implementation in 2001, a role that required continuously learning new skills, new tools, new technologies and developing new expertise. In her role in Information Technology Services, she provides support to students, faculty and administrators. 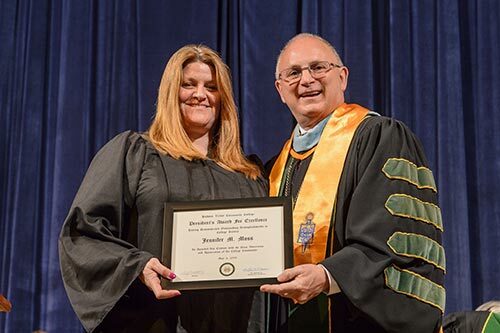 Jennifer M. Moss, of Troy, has been with the college since 2009. Those who nominated her for the award said she has been both a supportive colleague and a wonderful student advocate, showing great concern for the welfare and success of the students and parents she interacts with. They also lauded her organizational skills and willingness to assist with any task to help students, in addition to performing the duties assigned to her as a principal account clerk in the Cashier's office. Daniel J. Capuano, of Altamont, has been with the college since 1991. In his role as Environmental Science assistant professor, he is known by students for assigning hands-on "citizen science" coursework and policy activities that are often completed in cooperation with local environmental specialists. In his classes, students have worked with professionals from the Albany Pine Bush Preserve Commission, Audubon Society of the Capital Region and Grafton Lakes State Park, and participated in campus environmental science-related surveys of faculty and students. Founded in 1953, Hudson Valley Community College offers more than 80 degree and certificate programs in four schools: Business; Engineering and Industrial Technologies; Health Science; and Liberal Arts and Sciences; and an Educational Opportunity Center for academic and career training. One of 30 community colleges in the State University of New York system, it has an enrollment of nearly 11,500 students and is known as a leader in distance learning initiatives and workforce training. Hudson Valley has more than 75,000 alumni.